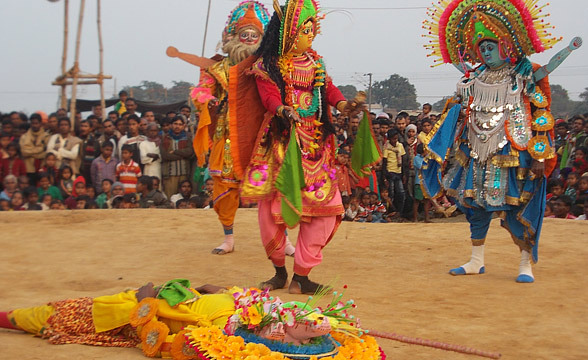 "Chhau is a dance of wars and has steps resembling a martial art performance. 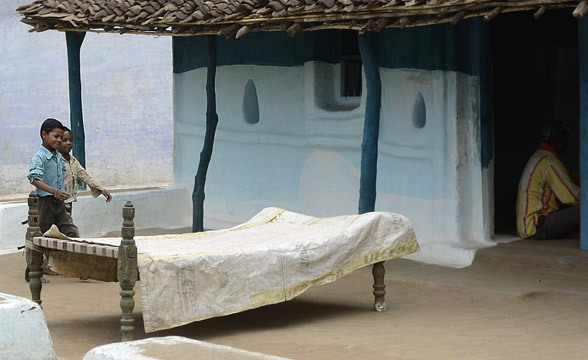 It has the merits of 'Nritta' or nature of 'Tandav' as described in the 'Natyashastra' of Bharat. The forms have also evolved according to the regional characteristics. 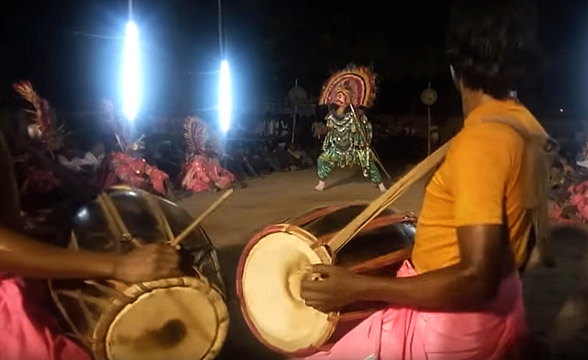 As a result there are two other styles from the original style of Seraikella Chhau Dance : Mayurbhanj style and Purulia style. 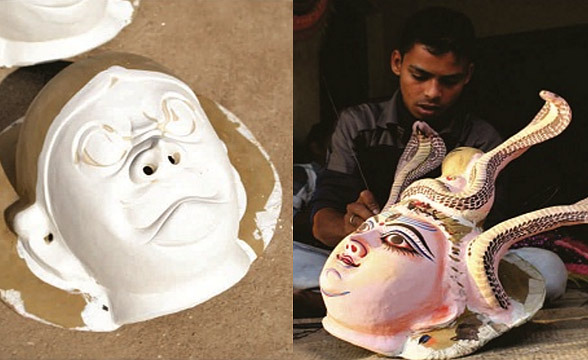 Widespread in the areas of Jharkhand, Orissa and West Bengal, it has been enriched with classical elements and techniques over a long period of time. The dance has always kept its relevance to the masses at its centre and so it kept evolving and changing as a perennial stream over so many centuries. What has kept the masses interested is that the stories of Chhau dance are not only taken from Ramayana, Mahabharata and Purana, but it has included themes that are more relevant and reflective of our lives... like the agricultural life, social problems, natural beauty that surrounds us, historical facts, national spirit, Sanskrit poetry and other important subjects.Different views are found regarding the nomenclature of the Chhau dance. Some people say that the name Chhau is derived from the word ‘Chhauni’ meaning a military camp where the dance evolved from the martial art. They believed that this folk dance was performed to entertain the Oriya warriors inside the camps and has spread gradually from there. While in Bangal, the word 'Chhau' ordinarily means a mask and because the dance is performed by use of mask, it is called 'Chhau dance'." "However, one has to pass through different stages of training to learn all aspects of the dance... so, let's begin!... 'Chhawk' is Four Corners. It is the first stage of training. In this stage of training one has to pose in a square form by standing on two legs. 'Dharana' is the second stage of learning. In this stage one learns the basic techniques and positions of holding a sword shield and keep walking. The remaining positions are almost same as the Chhawk. 'Tobka', the third stage means stylized movements. In Seraikella and Purulia Chhau it is known as 'Chhalli'. On the basis of the techniques of walking this Tobka is further divided into six sub-types namely- Sada Tobka, Lohra Tobka, Duba Tobka, Uska Tobka, Dhew Tobka and Muda Tobka. ""How is it that we never say anything or sing anything while practicing...?" asked Setu. "The story contained in each number is not narrated in words but depicted only through dance movements. Therefore, it is essentially a form of non-verbal theatre, in which actors express themselves only through movements. ""Chhau is a dialect which means six faces viz., forehead, eyes, nose, cheeks, lips & chin and a mask bears the six parts of the face. 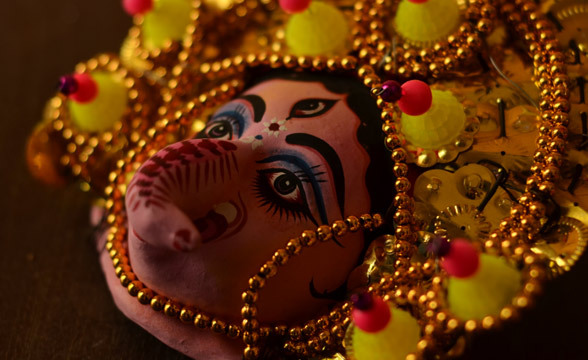 Masks traditionally used for Chau dance depict Durga, Ganesh and various mythological characters. ""And also animals & birds like peacock, tiger, monkey, lion etc... Which one would you like to play? " He asked knowing his affinity towards them..."All... " came a quick response. "To perform a dance many people play their role; there are dancers, music players, costume makers and mask makers. However, masks are the main attraction of the dance and artisans developed them with unique charters and styles. ""But Guruji, I never needed one when I became a Deer or a Rabbit or a Lion....""... the audience needs to see it on you in order to appreciate the Deer, the Rabbit, the Lion inside you... a performer lives a duel life, one on the stage and one off it. It takes a lot of time for the audience to accept both as one and therefore so much time for the artist to live as one... An artist then becomes a bridge between the two worlds... The world of eternal beauty that wants to speak and the worl it wants to speak to... Setu!" He smiles...."How are they made?" "And so, the artisans use local material to make these masks...First a clay model for the mask is made and dried in direct sunlight to make it hard. It is then covered with powdered ash and layers of paper moistened with gum are pasted on this powdered mask. 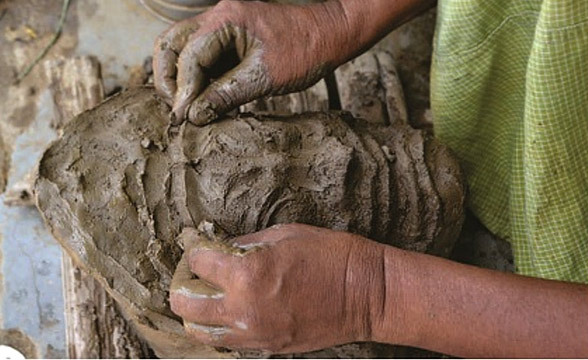 It is again covered with clay then. On drying, fabric pieces are pasted on it effectively. The mask is then polished. Once dried, the first layer of earth is removed by buffing. Then the first coat of white paint is applied. 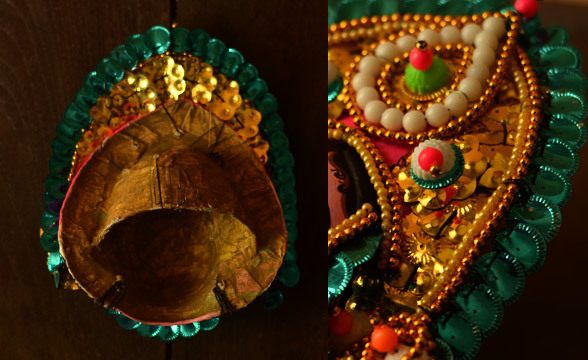 Finally, the mask is coloured and decorated with embellishments according to the character it represents. 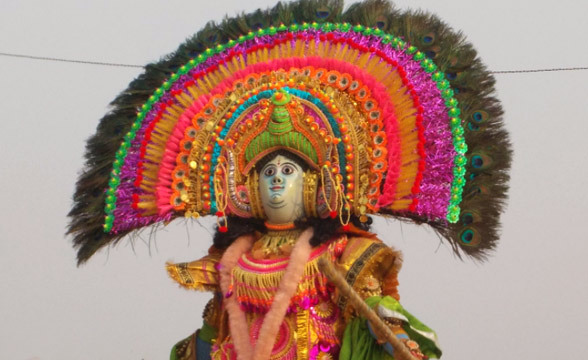 Wool, jute, foil, bamboo sticks, plastic flowers and beads are used for ornamentation. All the members of a family are involved in its making. The youngsters of the family are also engaged... Artisans have also improvised dance accessories as art pieces..."
Mask, a noun suggesting something put on to change or hide identity, to get out of ones or into anot..